MPL-7: All even between two time champions Aizawl FC & Chanmari FC! Home / Indian Football / I-League / MPL-7: All even between two time champions Aizawl FC & Chanmari FC! Two time Mizoram Premier League champions Aizawl FC and Chanmari FC were able to trade blows throughout as they battled to an entertaining 2-2 draw in the first match of round 2. Aizawl FC had taken an early lead in the match when Isak Vanlalruatfela put through Lalremsanga who calmly finished it into the net. But their lead only lasted eight minutes as Chanmari FC hit back on a set piece. Laldampuia’s delivery was met by a rising Rosanga for an equaliser. Aizawl FC retook the lead on the 39th minute when both teams had looked set to go into the break all square when Chanmari FC’s goalkeeper M.S. Dawngliana miscalculated Isak Vanlalruatfela’s well struck shot to give momentum to the I-League club going into the break. Chanmari FC started the second half with intent and their efforts came into fruition midway in the second half. Thomas Lalengkima’s delivery found Lalnunzama who did very well to put his side on level terms. There was late drama when Chanmari FC’s Rosanga was sent off after he had no choice but to bring down an Aizawl FC player when he was the last line of defence. 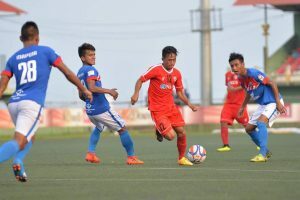 Chanmari FC were able to keep their shape at the back after being reduced to 10 men even when Aizawl FC went for the kill with the introduction of Vanlalduatsanga. There was end to end stuff till the final whistle as both teams looked for the winning goal with Chanmari FC’s Lalnunzama again coming close for his side. Previous XtraTime VIDEO: Mohun Bagan celebrate their CFL triumph! Next VIDEO – SAFF Cup: India 3-1 Pakistan – Match Highlights!